It was my birthday yesterday, and true to form we took the chance to go out to eat. This time we headed to a place called "Lawry's", an American steak chain in Umeda. 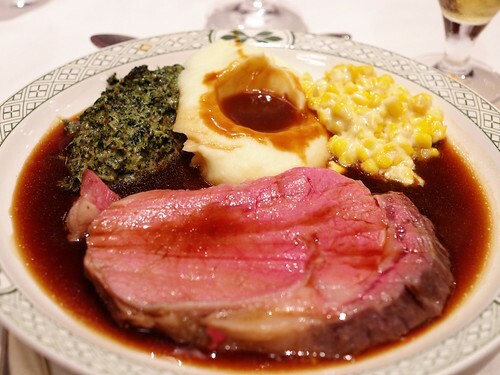 It was quite good, especially the main dish, a cut of rib roast with mashed potato, stewed spinach and creamed corn. I particularly appreciate the grated horseradish and cream - though perhaps in deference to Japanese palates he horseradish was served separately from the whipped cream, not mixed into it. The main dish was a cut of rib roast. Very good, but a lot of food. This was the "California" cut, the next to smallest cut they had, and it was really too much for me. They offer a still smaller cut in Japan called the "Osaka" or "Tokyo" depending on the location, and that would have been plenty. Even that was too much for Ritsuko, who had to leave some behind. As it is my birthday, and as I was away for a week in Tokyo for work just recently, I decided to take the whole weekend off. And this is when I realized I haven't updated this blog in a month. It's not just the blog either. I have film scans from this winter still waiting to be edited. I haven't read a page in my current book for months. There's a bag of parts on my desk for an antenna amplifier just waiting to be put together, and it's been there since April. I sat down to work a bit on a small software project of mine today and realized I last touched the code in January. 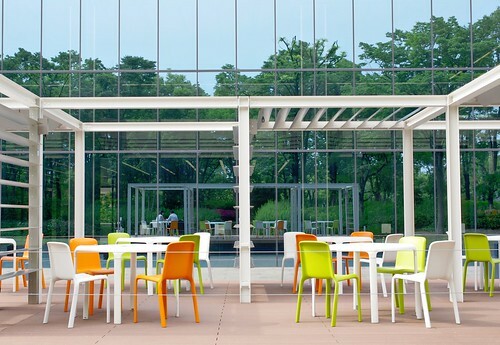 An office building in Umeda has an outdoor office space, so people can work and have meetings outside. Good idea. The reason is work, of course. This is the last year of our project and the last year of my employment, and the effective deadline for results is uncomfortably close. That's why I spent a week in Tokyo earlier in June, working directly with the other researchers on the project. But there's other things as well. I'm going to a conference called CNS (Computational NeuroScience) in Prague in mid-July, where I'll hold part of a tutorial on using NEST and MUSIC for neural network simulations. And the next JLPT — Japanese Language Proficiency Test — is the coming Sunday. So it's difficult to find time for things that need sustained focus. There's always something more I should be doing for our project, or preparing for the conference. When I do have a stretch of uninterrupted time it's better spent on studying Japanese rather than on an idle hobby. 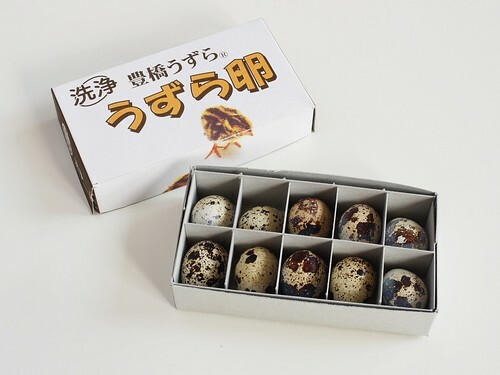 Quail eggs are common here, but they're usually sold in the same kind of clear, plastic packages you get hen eggs in. Practical and cheap, but boring. Ritsuko found one place that still sells them in cardboard boxes like this one. Makes them look special, even precious, doesn't it? Like marbles, or polished rocks. But all is not lost. The end is in sight. JLPT will be over next week (not that I'll pass, mind you). And much as I look forward to CNS in July, it'll be one less thing to spend time on afterwards. Our project will effectively end with a symposium in October, so that, too, will calm down a bit in a few months time. Once we get into autumn I should have more time to spend on other things — and more time to write about it.